You can grow ginger from a healthy finger of root (actually a rhizome) from the grocer’s or supermarket. Look for one with a pointed growing bud at the end. Like seed potatoes, ginger can be encouraged to produce shoots by keeping the root in a warm, bright place for a couple of weeks. To plant it, set the root, bud-end up into a pot of soil-based potting soil. Bury the root about 5cm (2in) deep. Keep the potting soil moist and then, once the plant gets growing, apply a houseplant feed every few weeks. Pot on into larger containers as the roots reach the sides of their pots. As the plant grows, pot it on into multipurpose potting compost, enriched with some garden compost. The leaves may yellow in winter due to low light levels. Keep the plant indoors over winter, away from draughts, and it should spring back to life the following growing season. Plant up lemongrass stalks into containers of potting compost mixed 50:50 with gravel for drainage. Keep the pots somewhere warm – around 18ºC (64ºF) should do the trick. 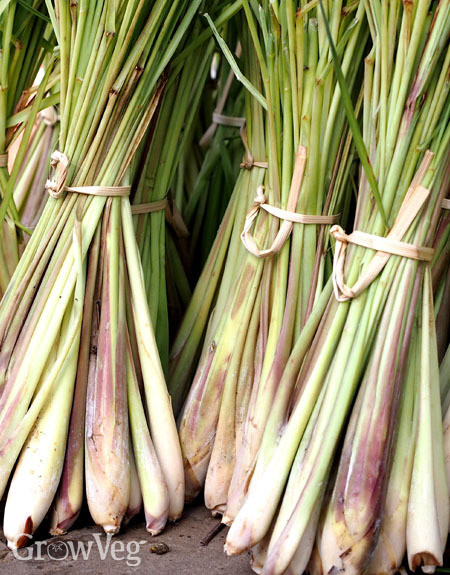 Once roots begin to grow and fill the pot, the lemongrass can be potted on into potting compost that’s rich in organic matter, perhaps improved with your own garden compost. Give your plants plenty of light and water and apply a balanced liquid feed every few weeks. You can even plant them out into garden beds after any danger of frost has passed.